In 1961, the Seiyu-kai began its operation as an alumni association for ex-participants of the Japanese Goodwill Mission. In 1968, Seinen-no-fune-no-kai was organized by ex-participants of Japanese Goodwill Cruise. In 1985, to consolidate the position as an active organization, Japanese Youth Goodwill Mission Seiyu-kai and Seinen-no-fune-no-kai were united into the International Youth Exchange Organization of Japan. The IYEO prescribes its code, “Based on the resources gained from international youth exchange programs, IYEO deepens international understandings and contributes to international friendship. Through the activities, IYEO renders services to society in wider fields and strives for mutual exchange among members and study for members.” In order to achieve this goal, there exist 47 local organizations in all the 47 prefectures. In most cases, these organizations operate as International Youth Exchange Organization of the respective prefecture. However, some groups use their original names or are under different names when they were united with an alumni association of international youth exchange programs sponsored by their local bodies. All of the organizations in the 47 prefectures are registered as member organizations of the “Center for International Youth Exchange” which is a non-profit corporation. 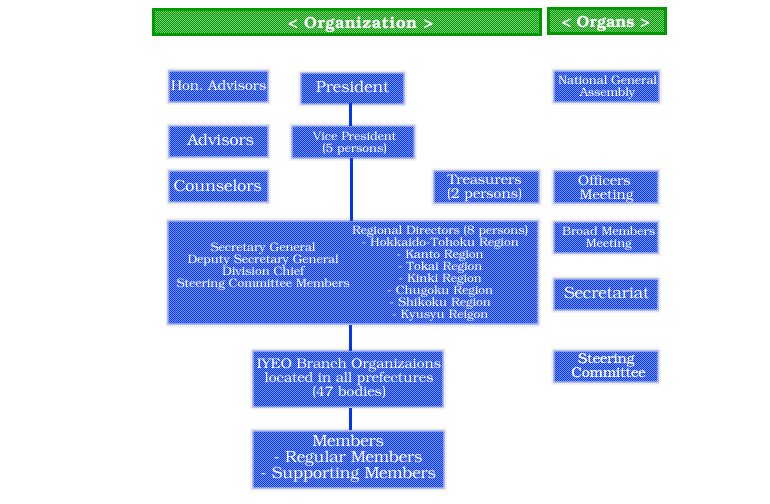 The headquarters of IYEO promotes mutual understanding and communication among members and helps prefectural organizations to perform various activities smoothly. At the same time, it aims to strengthen ties with foreign ex-participants of Ship for Southeast Asian Youth Program, Ship for World Youth, and such. The main activities of each prefectural organization are to contribute to the promotion of international youth exchange in the local district, to extend its social services to wider extent, and to cooperate for the improvement of international youth exchange programs sponsored by the Cabinet Office. The IYEO holds a system to actively support the post-program activities of ex-participants as well as local activities in order to enrich international exchange. IYEO has long been making efforts to be appointed as a legal body. Its purpose was recognized and the establishment of Center for International Youth Exchange was permitted by the Japanese government in April 1994. From now on, the IYEO will actively take part in international exchange activities in a close cooperation with Center for International Youth Exchange so as to contribute to the society. From the view point of the Cabinet Office, the IYEO is the result of its international youth exchange programs (i.e. human development), and the CENTERYE is the implementing contractor of its exchange programs. From the view point of the IYEO, the Cabinet Office is the foundation of social advancement and provider of the cooperation for exchange programs, while the CENTERYE plays a secretariat function. 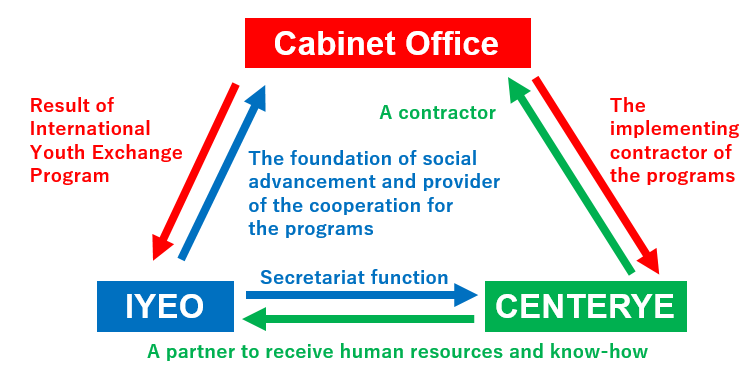 From the view point of CENTERYE, the Cabinet Office is a contractor, while the IYEO is a partner to receive human resources and know-how. Copyright © 2019 International Youth Exchange Organization（IYEO). All Rights Reserved.